Cook the barley according to package directions, or in plenty of lightly salted boiling water for about 35 to 45 minutes until it is plump and tender, and still slightly chewy. Drain and cool. Tenderize the kale by blanching it in boiling water for 2-3 seconds or cooking in the microwave for 1 minute. Rinse the pieces in cold water to stop the cooking and squeeze dry. Fluff and uncrimp the dry kale pieces with your fingers. 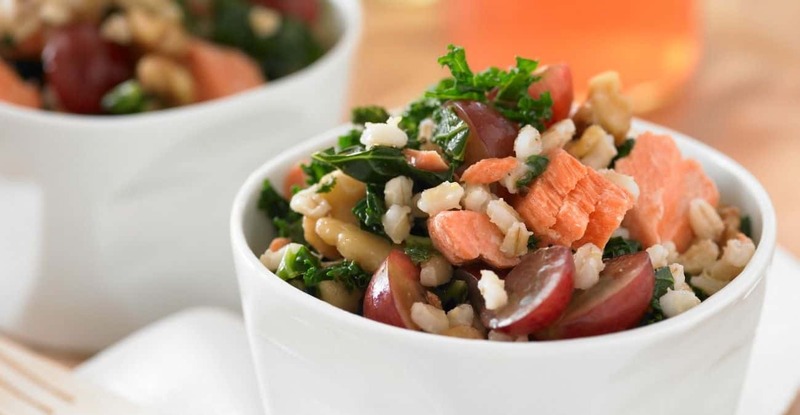 In a medium bowl, mix together the barley, kale, grapes, salmon and walnuts. To prepare the dressing: In a small bowl, whisk together the lemon juice, garlic, salt, pepper and cayenne. Gradually mix in the olive oil. Pour onto the salad and fold gently to combine. Serve immediately or refrigerate. Image and recipe adapted from Grapes from California.